When developing a case lifecycle management solution, the Stage Designer allows application designers to easily decompose a case into distinct actions to complete. Since these actions can represent very different things – simple tasks, complex flows, and even other cases – the Process Outline allows designers to quickly drill down into the individual elements to easily create and maintain process logic without needing to leave the Stage Designer. The top portion presents a series of chevron shapes that represent the primary case stages. You can click a shape to view its steps in the Process Outline. When configuring steps in the Process Outline, remember to save your changes by clicking Save in the Case Designer header before switching to another stage. To the left of each multi-step process is a clickable arrowhead that expands and collapses the process to provide access to the steps within the process. When the Process Outline displays a single-step assignment or case step, the name that appears in the left pane may differ from the name in the Stage Designer. This occurs because the Process Outline displays the name of the flow shape, rather than the name of the flow itself. The remaining portion is the workspace, which displays information about the selected step. For multi-step processes, the workspace displays the flow rule in the Process Modeler. For single-step assignments and cases, the workspace bypasses the flow rule and instead displays the properties panel for the corresponding shape – either an assignment (for a single-step assignment) or a utility (for a case). When configuring a step with the Process Outline, remember to save your changes by clicking Save. Once you finish configuring steps, click Back to Stages to return to the Stage Designer. Start and End shapes do not appear on the outline tree. 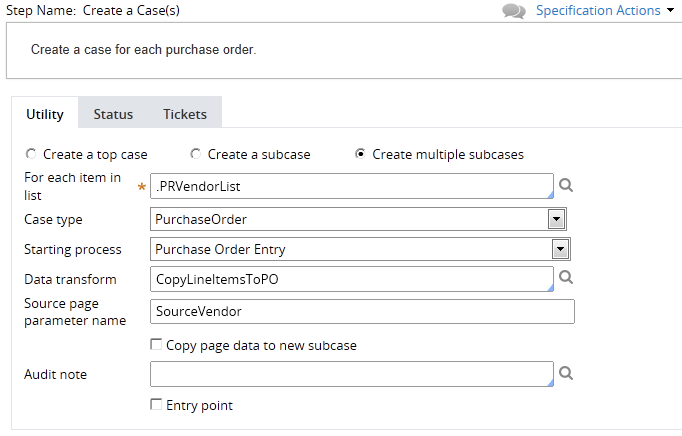 Convert a single-step assignment or create a case utility to a multi-step process. Right-click the Assignment or Create a Case shape. Select a shape from the menu list. The system automatically displays the new shape's properties panel to the right of the tree. The assignment or utility appear as a node under the Flow shape. Click the Flow shape to display the process in Process Modeler. By default, the system adds Start and End shapes and connectors. The original shape connects to the Start and the new shape, which also connects to the End shape. Edit a shape label that appears here and in the Process Modeler diagram. To do so, click a label, then make your updates in the text box. Add a shape to a multi-step process. Under a Flow shape, right-click a shape and select Add Shape > [shape]. The new properties panel appears to the right of the tree. Click the Flow shape to display the process. The system adds the new shape after the shape you selected on the tree, and draws connectors between the shapes. Remove a shape in a multi-step process. Right-click a shape under a Flow shape and select Remove. The system redraws the connectors between the existing shapes. If you remove all shapes except an Assignment or a Create a Case utility, the Flow shape disappears and reverts to a single-step flow. When you select a single-step assignment, the Process Outline displays the properties panel for the assignment shape. Since a single-step assignment is a flow rule containing only the one assignment, PRPC bypasses the flow rule and just displays the properties panel, as it would appear had you opened the flow in Process Modeler and viewed the properties panel for the assignment. 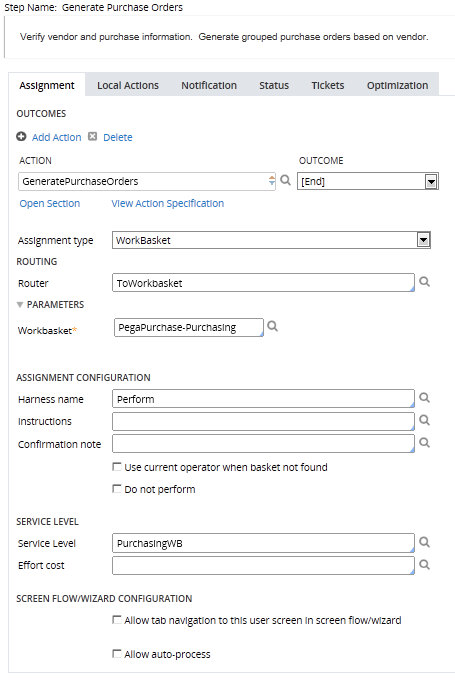 As a convenience, the flow actions that originate from the assignment appear in the Outcomes section of the properties panel. When you select a multi-step process, the Process Outline opens the flow rule using the Process Modeler. This provides full editing access for the flow for an application designer, as long as they have the necessary permissions to edit the flow. Within the embedded Process Modeler, you can perform any action that would be available had you opened the flow rule directly, such as add and remove flow shapes, configure shape properties, and reposition connectors. The Process Outline only provides access to the Diagram tab of the flow rule. To access the other tabs, open the flow in the Process Modeler. When you expand a multi-step process in the left pane of the Process Outline, you can click any of the listed flow shapes to view its properties panel. When you select a case, the Process Outline opens the properties panel for the Create Case smart shape. Since a case step is a flow rule containing only the Create Case smart shape, PRPC bypasses the flow rule and just displays the properties panel for the smart shape.